For many of us, our cowboy hats are like our friends. And sometimes a good friend needs good caring for. Your hat will stick around with you for many years to come if you keep to mind three basic aspects of cowboy hat care: storage, cleaning, and water. Sometimes, your cowboy hat cleaning will require professional attention, but most of the time, you can get by with a little bit of gumption and some good ol'-fashioned Cardenas Hats know-how! One of the more important aspects of continued hat care is also the most overlooked aspect: storage. Generally speaking, you would want to store hats in cool, dry environments. Hats tend to react badly to prolonged exposure to heat and moisture and either can make a hat to lose its shape. The worst place for a cowboy hat is in the backseat window of a hot car or truck! Fortunately, every Cardenas Hat is shipped in our custom-made hat box. This is by design. Not only does it ensure safe, damage-free transit to your front door, but it also serves as a great way to store your hat and protect it from excessive heat, dust, moisture, and, yes, even light! As we said earlier, there will come a day when your cowboy hat will need a thorough cleaning or “re-blocking" from a professional service. We still recommend general maintenance cleaning from time to time, though. Felt hats should be brushed regularly. Ordinary dust marks and smudges may be removed with the hat-cleaning cleaning sponge that we ship with every order. But you’ll first want to get rid of any heavy lint that has accumulated on the hat. → Using wide tape (e.g., masking tape, painter’s tape) gently apply the tape to the surface of the hat and quickly pull the tape away. You should see the lint transfer onto the tape. → Starting on the left side of the hat brush counter-clockwise around the crown and brim. → On the underside of the brim, brush clockwise. → With the hat brush, gently brush dirt from the surface of the hat. Start on the left and work counter-clockwise until you reach the front. → Let the sweatband dry naturally, but turn the sweatband down so that it’s not touching the inside fabric of the hat. Doing this will ensure that any sweat and oils will evaporate into the air rather than into the hat’s fabric. → If necessary, you can use a toothbrush to clean the sweatband more, if you need to. Lightly moisten the toothbrush with a mild non-detergent soap and lukewarm water. Gently rub the sweatband with the toothbrush. Be careful not to get the hat wet. Rinse and blot with a soft cloth to dry. Remember: Never apply artificial heat to the hat. Wool felt hats were not intended to be worn in the rain; however, depending on where you live, it might not be helped. If your felt hat does get wet, make sure that you flip the sweatband outward and set the hat upside down on its crown. This will allow the hat to dry naturally. Sometimes, a good offense is a great defense. We recommend using a water/stain repellent on your wool felt Cardenas Hat, like Scout Felt Hat Rain & Stain Protector (pictured). Lightly spray the repellent on your hat and use your hat brush or sponge to work it into the fabric. Remember to go counter-clockwise — except on the underside of the brim, which you brush clockwise. There are other water repellents on the market. Whichever you choose, make sure it is free of silicon. 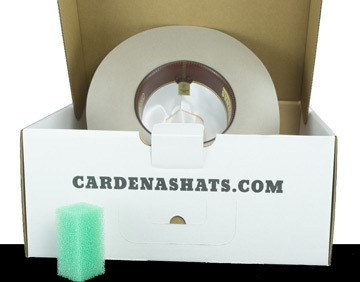 → Use your Cardenas Hat hat-box to store your hat and help prevent stains and discolorations. → If you place your hat on a flat surface, always set it upside-down on the crown. → Heat can cause the sweatband inside of the hat to shrink, leaving you with a hat that is too tight. So remember to always keep your hat in a cool location. → Adjust your hat by the brim rather than by grabbing the crown. Oils and dirt can cause spots. These oil stains can be difficult to see on some hat colors — that is, until it has accumulated. → Make your own make-shift hat stand at home with a coffee can (or something similar) that is covered with fabric or an old, clean T-shirt. Just by paying heed to these aspects of cowboy hat cleaning and care, you can keep the professional hat care services at bay longer, all the while keeping your hat looking nice and healthy for a long-time to come.